From the moment they wake up on a possibly strange planet, the four people thrown together have questions. The obvious ones: where are they? How did they get there? 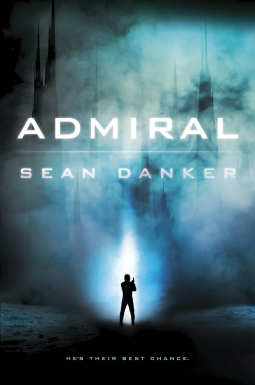 Is the man in the Admiral’s sleeping pod (the narrator) really an Admiral? And perhaps, most importantly: Can they stay alive long enough to get rescued? Thrown together by circumstances, the four coordinate their talents to try to find the way out. Every time they find a solution for one obstacle, it either fails in some unexpected and spectacular way, or they’re thwarted somehow. And scrambling to react, even as they try to figure out what happened: sabotage from some unknown fellow human, or from the hostile planet. Which makes for new trouble for them, and an exciting and engrossing read for me. There were funny bits too, mostly fueled by the Admiral’s interior monologue skewing towards snark. He’s got the bluff and bluster of a scruffy rogue, and enough heart and/or self-preservation to come up with plans and get the cadets to follow him. I’m not going to say I thought the words “scruffy-looking nerf herder” while I was reading some of the Admiral’s interactions with a cadet who may or may not have been akin to royalty on her home-world. But. Danker does a good job of combining past details to give the characters and worldbuilding context with getting down to business to move the action (and there’s a lot of action) forward. The events of the story take place in the tenuous peace following the war where the Evagardians conquered the Ganraens. Tensions and prejudices between the two are still making things uneasy and suspicious, even for four characters who have woken up on a marooned spaceship that seems to belong to the winning side. Details of the political and social assumptions slide into characters’ actions and words, fleshing out background without slowing down the pace. I like that. But, as the action pelts along between complications that seem to thwart every plan, it’s hard to believe they’ll find a way out. Especially in the last few chapters, where things take a turn from perilous to “I’m probably going to have nightmares about dark, shadowy corners” levels of creepy. It’s interesting to see the way their individual traits coalesce. They’re lucky to have the talents of Nils the engineer and Deilani the bio-tech, as well as Salmagard’s willingness to be brave. Even in dire circumstances, they have to do some work to trust each other, which I appreciate. Although this is the start of a series, and clearly leaves questions unanswered to give the plot room to continue, enough gets resolved to make it a satisfying read. Generally, Danker does a really good job with prose and description, to help visualize the strange planets and spaceships. Having the characters start out confused and curious helps make that more natural, but it also speaks well of Danker’s precise descriptions. I always appreciate a writer helping me visualize scenery and action, especially in a new scifi setting. I confess that I’m going to have to reread the last few chapters. I’m willing to forgive that as a flaw of trying to read fast action scenes past my bedtime, rather than a setback in the writing. It feels like a long time since I read straight out science fiction. If I could guarantee getting more books that gave me a mix of character, culture, action and suspense like this, I’d definitely read more. I guess there’s always the sequel.